Chippy's + TeamBuy = YAY! On Friday night we checked out the new Chippy's location on Bloor (the original, which is known for its rockstar clientele, is on Queen). We had a sweet deal through a TeamBuy.ca trial - those who bought into the deal pretty much got one order of fish, chips, a side (sauce) and a drink for free, because the discount was so good it was pretty much a "dinner for two" deal. Very cool. Even without TeamBuy, Chippy's is a reasonably-priced place to go for a casual fish and chips experience, with decent portion sizes for decent prices - I couldn't even finish my fries because my piece of haddock was so huge. They have some unique "sides" (which I'd more accurately want to call "sauces" - the closest thing to a "side" is their mushy peas) but don't look for any gravy - the closest thing they have is curry gravy, which is moderately hot and quite tasty. The haddock itself was flavourful and the batter was light and crunchy, which helped it to not feel as greasy as your usual fish and chips. But if you're someone who really prefers a ton of batter on your fish, you might find it a little on the light side at Chippy's. The two guys serving up the fish and chips were really friendly and were playing some great tunes (and, probably by some people's standards, loud tunes, but hey, it fits the scene there). They were also experiencing a rush of TeamBuyers because the deal we all bought into expires Aug. 31! 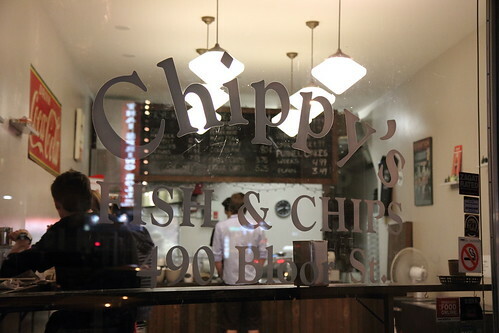 All in all, I'd say try Chippy's for a cheap and cheerful dinner if you're in the Bloor / Bathurst area, and try TeamBuy if you're a foodie - every so often a good food deal appears that's definitely worth taking advantage of. can you post your link to "TeamBuy"? or PM to me? I'd like to sign up, I can use your reference. I'm already on Groupon and loving it. Hi Katie - http://www.teambuy.ca -- enjoy!